CLER Ministries is Just Say Know Ministry! To download a copy of this letter from our founder click here. God is definitely doing a new thing with CLER Ministries! The sunrise at the top is from the last 2016 "Created To Be Me" camp at Bethany Beach, Delaware. As I stood watching this amazing sunrise it symbolized so much for me. A new day is dawning for this ministry that so many have faithfully supported through the years and that Richard and I have poured our lives into. I am incredibly excited with the direction that God is taking this wonderful ministry and I think all of you will be pleased as the opportunity is there for us to reach even more youth and families in the next 30 years than we did in the previous. The sunrise also symbolized a new path for Richard and me to walk with this ministry. When the transition is complete we will still serve as founders on the new Board of Directors and will always be around for consultation and reaching out to whatever else God has planned for us. What comforts us as we begin the process of letting go of responsibilities is the realization that God's vision will continue on bringing life-changing sexuality education along with spiritual enrichment to families and youth. On the following pages you will find details about how the congregational program and the Created To Be Me camping program will function as we move from ordering manuals to downloading materials from our website. 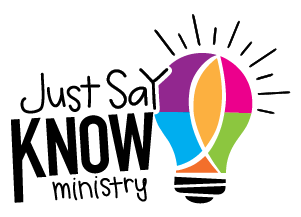 You will also see information about the Just Say Know Ministry Board of Directors, Executive Director and Keynoting Team Facilitator. We have amazing people who will carry this ministry forward. The Congregational Program is being updated and put into a digitalized format for churches and outreach agencies to download . Beginning March 1, 2017, Interested purchasers will be able to download the teacher manuals/CD-Roms and Student Resource Manuals directly from our website at a cost. Churches interested in presenting classes will no longer have to schedule with us or pay us for providing their manuals or fees that we charged for the administrative oversight of the material. While we will not be able to provide DVDs, we will be able to provide links for appropriate videos for use with the curriculum. Rev. Thomas McCracken of Fort Worth has been named as the Just Say Know Ministry Executive Director. The Created To Be Me Camping Program will be quite different as we move to the new model. Camps have been struggling to pay the fees involved with our camping program and because of the generosity of our donors and our belief that they will continue to support us, Just Say Know Ministry will be underwriting the costs of keynoters and their travel and all of the expenses involved with maintaining an adequate keynoting team. Licensed camping entities will be able to digitally download the Director Manual, Small Group Leader and Student Resource Manuals beginning April 1, 2017. Camps interested in continuing to be a "Created To Be Me" Camp will pay a $500 one-time Licensing Fee beginning in 2017 and then a $250 Maintenance Fee each subsequent summer. This summer the camps averaged spending about $800 per camp for "Created To Be Me" and this will be greatly reduced under the new plan. The spiritual and educational direction for the camping program will be directed by the "JSK" Keynoting Teams. They will meet each fall following camp to look at evaluations, etc., and to deter-mine the updates for the next summer. Rev. Suzanne Motter of Kansas City, has been named Just Say Know Ministry Keynoting Team Facilitator (KTF.) She will have oversight of the keynoting teams and the preparation of the Created To Be Me camping curriculum. While Richard and I are looking forward to having summers off since we will not be keynoting, we are not walking away until we see the new Board and part-time staff no longer have questions or need information. We love this ministry and after a summer of youth sharing their hearts with us and seeing so many lives changed, our hearts are full of the possibilities for the future with the new keynoting teams and new leadership that are coming on board.